Rwanda's upcoming presidential election has cast a spotlight on its democratic credentials, with observers warning that allegations of intimidation of opposition leaders could mar the process. "It is a very important event for our country because it is the second time we are electing a head of state," Chrysologue Karangwa, President of the Electoral Commission, told IRIN. "The people are preparing themselves for it." Observers say the prevailing political environment restricts opponents of the ruling Rwandan Patriotic Front (RPF). Paul Kagame has been president since March 2000, after leading the RPF to power in July 1994 and ending the Rwandan genocide. The slaughter of more than 800,000 Tutsis and moderate Hutus was by far the bloodiest chapter in a long power struggle between the minority Tutsis and majority Hutus. 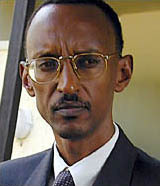 In August 2003, Kagame won 95 percent of the votes in the first national elections since 1994. His main competitor, Faustin Twagiramungu, won 3.5 percent. Kagame is widely expected to be nominated again as the RPF flag-bearer in the 9 August election, but recent incidents involving other potential candidates have fuelled concerns that the poll will not be fair. "It is very difficult to imagine any opposition candidates who can get a significant share of the votes," Thomas Cargill, assistant head of the Africa Programme at Chatham House, said. "The RPF dominates political life in Rwanda, but it is good for Rwanda to start going through the motions." He warned, however, that elections sometimes delivered only a semblance of democracy. "Like Ethiopia and Uganda, the governments of the day need to maintain the strings of power in some kind of democratic process. So you need an opposition. "These governments tread a fine line - allow the opposition to operate and field candidates, but in a way that does not readily give them any chance," he added. Aid workers in the capital, Kigali, and in Goma, in neighbouring Democratic Republic of Congo (DRC), are concerned about the potential fallout. "A political crisis in Rwanda could trigger a humanitarian problem, including displacement across borders," an international security observer at an aid mission in Goma told IRIN. "There is also the unresolved question of armed Rwandan militias in DRC." The alleged “lack of political space” in Rwanda is frequently cited by the Hutu diaspora, refugees and such DRC-based militias to justify their refusal to return home. Karangwa insisted nothing would disrupt the polls. "I can assure you the forthcoming elections are going to be free and fair," he told IRIN on 10 March. "We are working towards that objective and are totally open." Jean Paul Kimonyo, a policy adviser to Kagame, writing in The New Times newspaper of 9 March, said the country was on the right political track. "The issue here is how do you ensure political cooperation when confrontational politics will almost certainly lead to renewed violence? "Under President Kagame’s leadership, Rwanda has persistently ensured ownership of its nation building process by its citizens. It is much more challenging but certainly more promising." Rwanda has, since 1994, recorded impressive gains towards the Millennium Development Goals, according to the UN Development Programme. Primary school enrolment, for example, is now 97 percent of all school-going age children. Family planning, according to the World Bank, has tripled in the last three years, while assisted deliveries have increased from 39 to 52 percent. The use of insecticide-treated nets is up by 70 percent, and under-five mortality has fallen by 30 percent. Policies and laws that guarantee equal opportunities for men and women, according to the International Federation of Red Cross and Red Crescent Societies, have resulted in Rwanda holding a world record of women parliamentarians: 56.3 percent, just ahead of Sweden at 46.4 percent. This year, according to Finance and Economic Planning Minister John Rwangombwa, the economy should grow by 7-8 percent, up from 5.5 percent in 2009. Nevertheless, Rwanda “needs to open up and encourage past wounds to heal positively”, a diplomat in the capital, Kigali, told IRIN. Advocacy groups claim a lack of respect for basic political and human rights, and harassment of perceived political opponents. According to the Commonwealth Human Rights Initiative (CHRI), an Indian NGO, article 13 of Rwanda’s constitution, which makes it an offence to engage in “revisionism” or “negationism” [denial of genocide], has been “broadly defined to include anyone who disagrees with the ruling RPF’s account of the genocide”. "CHRI is deeply concerned at the continued restrictions and threats to opposition parties in the run-up to Rwanda’s Presidential elections,” it said in 6 March statement. Referring to a 25 February warning by the security ministry that politicians who “slander the country” or are “against public unity” would be punished, it called for “immediate steps to ensure respect for the basic, universal rights to freedom of expression, freedom of association and peaceful assembly of opposition parties”. The 3 February attack on Victoire Ingabire, president of the United Democratic Forces party, and her aide Joseph Ntawangundi, by a mob in Kigali was the most visible example of opposition harassment so far, the Nairobi analyst said. Attacked while reportedly collecting party registration documents, she reportedly lost her passport, while Ntawangundi was severely beaten. 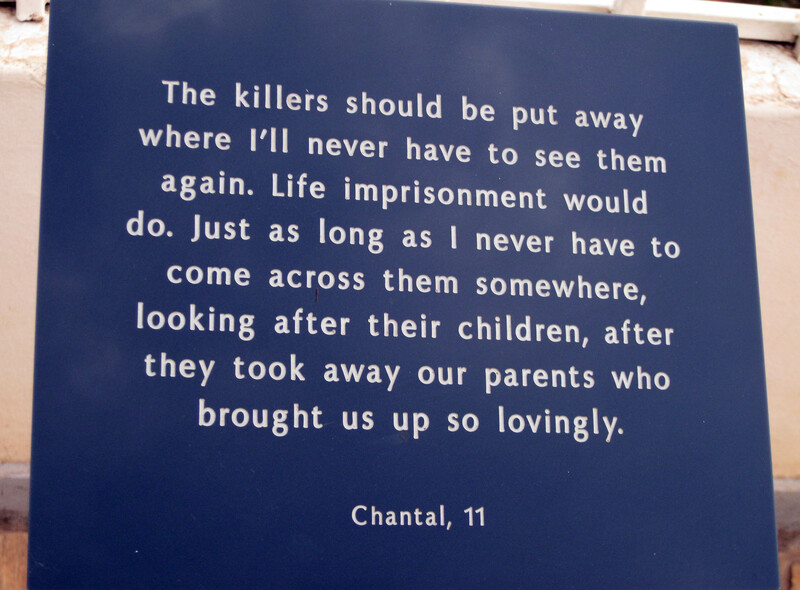 a plaque at the Kigali Memorial Centre. The Centre is built on a site where over 250,000 people are buried. Ingabire returned to Rwanda in January, after living in Europe for 16 years. During a visit to the Gisozi Genocide memorial site, she upset survivor groups by alluding to the killing of Hutus, 85 percent of the population. The day after the attack on Ingabire, Frank Habineza, president of the Green Party, reported being threatened. Earlier, the leader of the Ideal Social Party, Bernard Ntaganda, was called before the senate to answer accusations relating to propagation of genocide ideology. Soon after, local government minister James Musoni warned politicians "who violate the constitution and the rule of law by politicking along ethnic lines. Whatever they do should not be a stumbling block to people's peace, unity and security," he said in a press statement. “Politicians and all those who wish to practise politics are not allowed to do anything that undermines the sovereignty of Rwanda and its citizens." The attack on Ingabire, Human Rights Watch (HRW) said, “appeared to have been well coordinated, suggesting it had been planned in advance”. Karangwa denounced HRW. "That woman has not been beaten, not at all," he told IRIN. "I do not believe the entire Human Rights Watch report. In our country there is no intimidation or harassment of opposition leaders." Kigali resident Joseph Barigye said Ingabire had "provoked" people. "The memories [of the genocide] are still fresh, so one needs to talk to people carefully," he told IRIN. "And that is the reason Kagame will win again." Ingabire, in an interview with The EastAfrican newspaper on 15 February, said: “Kagame's government is not ready to accept opposition. This is why they sent young men to beat me and my aide two weeks ago - which was a true reflection of the lack of democracy and freedom of expression in Rwanda. Kagame told a recent news conference that Ingabire had "gone too far in abusing the country’s goodwill in attempting to destroy [Rwanda’s] positive steps", but "whoever tries to act in contradiction to what the laws say will not be given room". Meanwhile, there are concerns about Kagame’s relations with the media after he publicly accused unnamed journalists of conspiring with two former military officers he accused of carrying out two recent grenade attacks in the capital. “Kagame’s televised warnings will help silence critics prior to the August presidential election," wrote Tom Rhodes, Africa programme coordinator of the Committee to Protect Journalists, on the organization’s website. “With pro-government media outlets outweighing the country’s beleaguered private press, the chances of balanced election coverage are now slimmer than ever,” he added. Chatham House’s Cargill said Rwanda's past had to be put in context. "There are clearly some authoritarian tendencies within the Rwandan state, but Rwanda is coming from a place few countries have to been in recent years," he told IRIN. "Still, there is a need for balance because the government is using all the advantages of incumbency."